You have to go all the way back to 1986 to see Schlumberger this cheap. The recent market decline has led to some stocks looking more attractive than they have in some time. Few stocks look as cheap as oil services giant Schlumberger (NYSE:SLB). As a result of this most recent decline, shares of the stock now trade at a price to book value of 1.4 times. 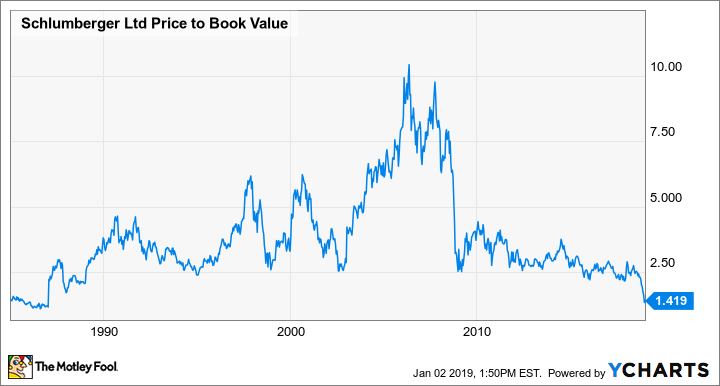 The last time shares of Schlumberger traded for a price to book value this low, I was still in diapers. SLB Price to Book Value data by YCharts. It's not as though Schlumberger is some mom-and-pop operation, either. This is the world's largest oil services company and has a history of generating returns for investors over the long haul. Has something fundamentally changed about its business or the oil market such that it is no longer a viable investment? 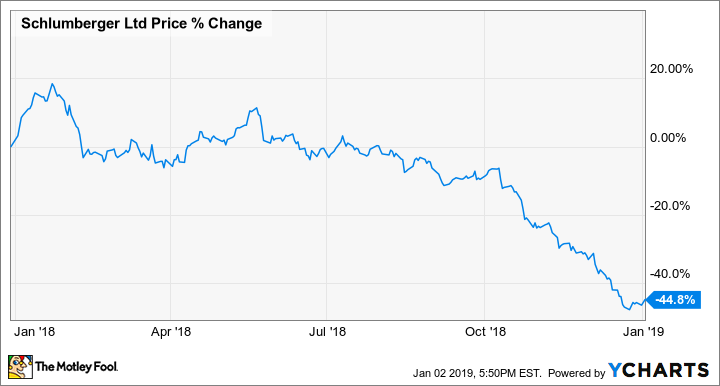 Let's take a look at what has (or hasn't) changed for the company in recent years to see if this cheap price is a sign of the future or an incredible buying opportunity. The oil services industry lives and dies by the capital spending of oil and gas producers. For much of the 21st century, that has been a great business to be a part of. Concerns of "peak oil" and persistent undersupply pushed oil prices north of $100 a barrel, and some companies were spending massive amounts on megaprojects for unproven oil sources like the Arctic. The more complex the project, the more revenue for oil services companies. This was especially true for Schlumberger because its specialties are largely outside North America and involve complex, service-intense jobs that require advanced exploration and development technology. In 2014, though, that dynamic started to change as horizontal drilling and hydraulic fracturing became a commercially viable method for producing oil and gas. The ability to quickly go from an undisturbed field to a producing well in a matter of weeks led to a rapid increase in supply that helped lead to the oil price crash from 2014 to 2016. As prices dropped from $110 to less than $30 per barrel, so, too, did capital budgets of Schlumberger's clients. While capital spending has picked up a bit in North America for shale drilling, the same can't be said for international and offshore oil activity. Schlumberger's management has been saying for more than a year that the amount of global spending isn't enough to offset the natural decline of producing wells and meet increasing demand. That has yet to materialize, though, as shale production in the U.S. has been much more prolific than many anticipated and has further delayed spending on larger projects worldwide. The more shale drilling in North America can fill production supply gaps, the longer it is going to take for Schlumberger's business to perform at its best. Yes, it has a large presence in North America and it continues to be a profit center for the company. For it to generate the returns to which investors have become accustomed, though, Schlumberger needs global capital spending to increase. The way the market is pricing its stock today, it would appear there is a lot of confidence that shale will be the predominant source of new supply for some time. Shale production has been nothing short of astounding in 2018. The U.S. Energy Information Administration's initial forecast for 2018 production was an increase of 600,000 barrels per day. Based on data from January to October, that forecast underestimated by more than 900,000 barrels per day. Bringing that much oil to the market helped to offset what was initially pegged to be a year where supply growth was looking shaky. The question for 2019 will be whether shale can deliver even more production growth because the expected supply gap is even bigger. According to private equity group Burggraben Holding, the average rate of decline for existing sources means we will need 3.1 million barrels per day of new sources just to replace existing demand. Add in the historical demand increase -- about 1.5% annually -- and global production will need to come up with 4.6 million barrels per day of new supply. Based on published project schedules, there are about 1.5 million barrels per day of production additions slated to go live in 2019, so shale and other sources need to come up with the other 3 million barrels per day. That's a tall order for shale, and if it can't be met, then companies will need to start spending big bucks on new sources elsewhere. If this does come to pass, then Schlumberger could be headed for much better times ahead and investors will forget about this recent rough patch. Shale drilling in North America has really thrown a monkey wrench in the oil market. Its ability to quickly ramp up production much faster than anyone could have imagined has flummoxed oil and gas executives who know more about this business than you or I could ever hope to know. The numbers don't lie, however, and it's going to become more and more difficult for shale and other short-term supply sources to meet the challenge of replacing existing production and growing demand. Whether that happens in 2019 or further down the road is hard to predict. But the more producers kick the can down the road and don't invest in other sources, it will mean even higher rates of spending eventually. A lot of those capital spending dollars will likely flow to Schlumberger, which could make today's stock price look like a steal.